Be still my spicy, chili lovin’ heart! This is for those days when you need comfort food but you’ve already had takeaway 3 nights this week and feel like you need to give your body SOMETHING nutritious. This recipe feels awesomely indulgent but still packs a healthy punch. As always, top quality eggs make the difference. Basil or Coriander for decoration. Heat some olive oil in a frying pan on a medium heat. Chop your chili and garlic and add to the pan. Sprinkle over your teaspoon of paprika and let it sizzle for about 1 minute. Add the tin of tomatoes and the chili paste. Squeeze over the juice of half a lime. Season with salt and pepper. Give it a good stir and cook for about 3-4 minutes so it’s nice and thick. Make a well in the sauce with a wooden spoon and crack an egg into it. Repeat this for all your eggs. Cover the pan and leave to simmer on a low heat for 3-4 minutes or until the eggs are cooked. Remember they’ll keep cooking when you take them off the heat. Meanwhile put your bread in the toaster. Peel and mash your Finely chop your rocket and mix it in with the avocado. Season with salt and pepper and add a little olive oil too. 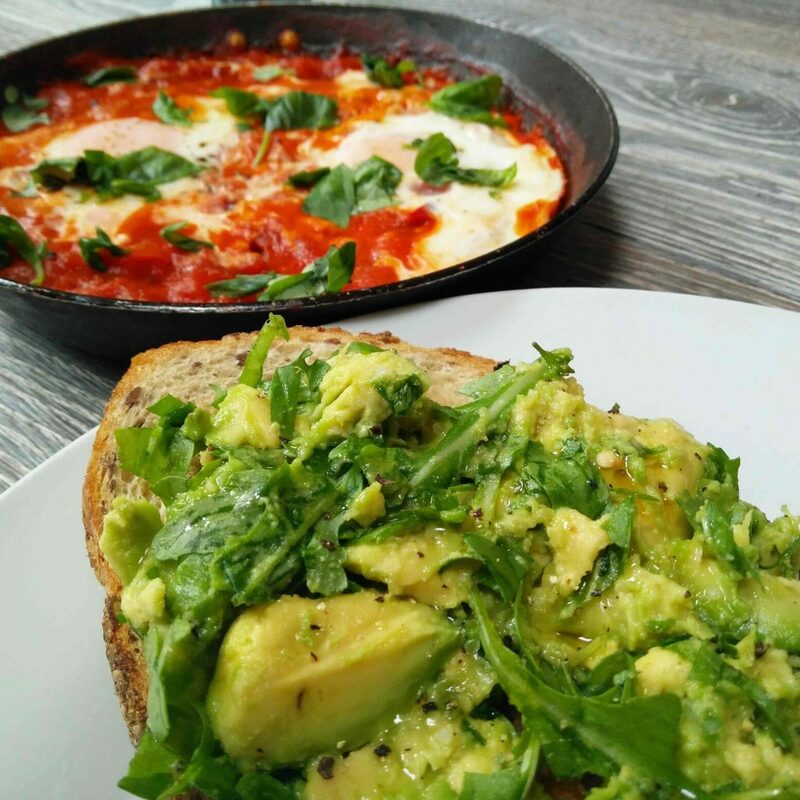 Spoon the eggs into bowls with slatherings of the amazing spicy tomatoes and serve alongside the cooling, creamy avocado toast. Sprinkle a bit of torn basil or coriander on top for the perfect finish. Job done! Love this recipe? Share the love! Visit my recipes page for more veggie inspiration. Make sure you subscribe! Special Offer claxon! You can get a Leafcard to give you FREE VEGETARIAN MEALS in London for a whole year, for just £1. See how here. Ahhhh this looks INCREDIBLE! Love any kind of baked eggs so this is a winner!